This review was first published in Perdeby on 15 October 2012. “Why don’t I know the answers? / Why don’t I know the truth? / Why do I feel like this is all I do?” asks an incensed Greg Carlin on “I’ll Blame You”, the first single off Zebra & Giraffe’s third album. He’s perplexed, resentful and slightly menacing, and he’s letting everyone know it with the beautifully crafted, if slightly disturbing, lyrics he pens on The Wisest Ones. This is Carlin as we’ve never seen him before. On The Wisest Ones, he explores the dark side of love: when you love the wrong person or, even worse, when you love the right person imperfectly. And then there’s songs like “Sons”, which is like a letter to Carlin’s brother after their parents got divorced many years ago. “Look at our father/ He’s lying in the corner/ At home/ Please give him water/ And watch his as he drowns/ Alone,” he sings candidly. You get the sense that, with The Wisest Ones, Carlin is letting it all out. It’s the equivalent of him sitting on a bulky red couch in a shrink’s office, relaying his woes, and you can’t help but be grateful that he is brave enough to share it with you. But, this is not the only noticeable change on the SAMA-winning electronic indie rockers’ latest record. Without someone solely devoted to the keyboards this time round, Zebra & Giraffe have used The Wisest Ones to experiment with a rawer, dirtier guitar-driven sound. “Yesterday” starts off with a bristly riff and culminates in a mass of pent up guitar anger that the band has been hiding all this time; while a wailing guitar stands out on “Denied” and “You’re Nothing To Me”. The jagged synth/guitar-created opening of “Sick” sounds like a rabid disease spreading rapidly, with Carlin warning, “I’ll make you sick/ Try not be fooled/ I’m damaged goods/ I’ll eat the good inside you”. They’re good at this new sound. So good. A far cry from The Inside, and an even further one from their debut album, Collected Memories, Zebra & Giraffe have finally come into their own. 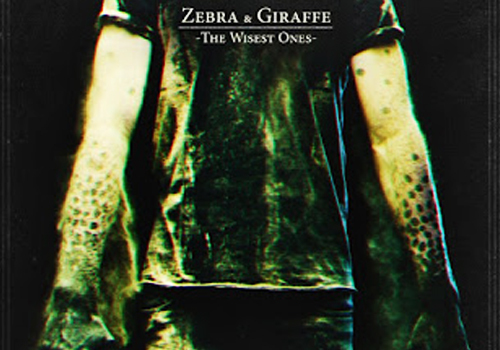 While many fans won’t take to the band’s dark metamorphosis and might feel uncomfortable because of the stark lyrics, The Wisest Ones speaks of a willingness to try something new and refreshing, and Zebra & Giraffe should be applauded for doing just that. Read the interview I did with Zebra & Giraffe when they performed at Arcade Empire on the Pretoria leg of their The Wisest Ones tour.